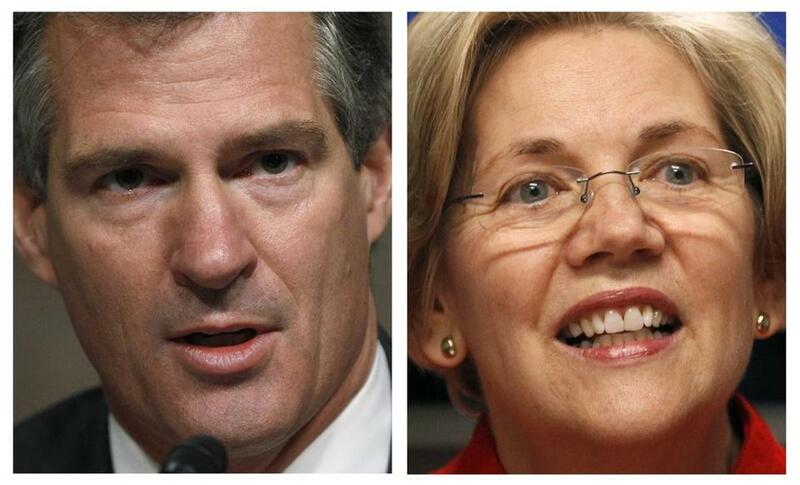 Scott Brown and Elizabeth Warren are locked in a tight race. A new Boston Globe poll shows that the race between Senator Scott Brown and Elizabeth Warren is essentially tied, with ample opportunity for both candidates to win the nation’s most expensive Senate contest seven days from now. The survey indicates that Brown holds a razor-thin 45 percent to 43 percent lead over Warren among likely voters, well within the poll’s margin of error of plus or minus 4.1 percentage points. Brown’s lead evaporates, with 47 percent for each candidate, when voters who are undecided are asked which candidate they are leaning toward. The poll is a reversal of results of a September Globe survey that showed Warren ahead 43 percent to 38 percent, as well as several other recent polls that have found Warren with a slight lead. The shift underscores the belief, long held by both sides, that the race, active for more than a year, would be competitive until the end. “The race is a dead heat coming into the final weekend,” said Andrew E. Smith, director of the ­University of New Hampshire Survey Center, which conducted the poll of 583 likely voters from Wednesday through Sunday. Warren canceled following Senator Brown’s announcement that he would pull out of the debate, citing Hurricane Sandy, and a rescheduling was in doubt. The poll showed that Brown is accomplishing much of what he needs to do: winning Republicans and independents, denting Warren’s image, and competing for some Democrats. But Smith said ­Warren may still prevail because Republicans face daunting odds in a presidential year in Massachusetts, where high turnout adds to Democrats’ 3-to-1 registration advantage and the party’s ability to turn out the vote. Still, Warren has her own challenges, especially as Mitt Romney’s national poll numbers have risen. “Warren really needs to pull some of those waver­ing Democrats back,” Smith said. That would mean she needs to solidify support from voters like Steven Damon, a 42-year-old music teacher from the town of Gill, near the New Hampshire and Vermont borders. Damon, who participated in the Globe survey, said he plans to vote for President Obama and is undecided in the Senate race, but leaning toward Warren. “I don’t know enough difference between the two, and I keep hearing Scott Brown, with his reaching over the aisle speeches, which I like,” Damon said. Despite those warm feelings for Brown, “I’ll probably still end up picking Warren, because I lean ­toward the Democrats,” he said. Neil McCormack, a 28-year-old medical student who lives in Weymouth, is also voting for Obama. But the self-described independent will choose Brown for the Senate. In the final week, both candidates will be targeting voters whose profiles ressemble that of Janice Miller, 65, a retired dairy farmer from East ­Freetown, who said she, too, is voting for Obama, but, like Damon, is not sure whom to support for Senate. Miller, an independent, said she prefers Warren’s stances on the issues, particularly her ­emphasis on the challenges facing women and the elderly. “She knows the right things to say, being a little older and a little tougher,” Miller said. But she also likes Brown’s emphasis on bipartisanship. If the election were held ­today, Miller said, she would be anguishing in the voting booth so long that people would ­begin to worry. The poll was released the same day that Brown and then Warren backed out of a debate scheduled for Tuesday, citing Hurricane Sandy. Questioned about two statewide ballot questions, respondents in the poll appeared likely to legalize medical marijuana and physician-assisted suicide, although support for the suicide referendum has dropped significantly in the last month as opponents have mounted a major ad campaign against it. Some 47 percent of voters currently support the suicide ballot question, while 37 percent oppose it and 16 percent are undecided. That is a large drop from last month, when 68 percent supported the question, and 20 percent opposed it. 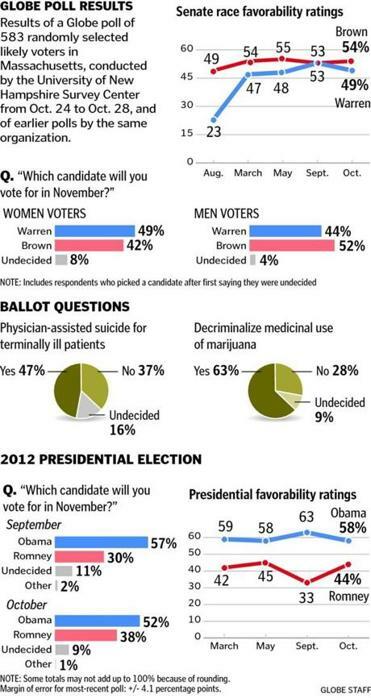 The marijuana question has maintained stronger support, with 63 percent backing it and 28 percent opposed. In the Senate race, the poll suggests that Brown may be pulling off a rare feat in politics, by remaining personally popular, even as he continues relentless attacks on his opponent. Brown, a Republican, may also be benefiting from the slight uptick in support for Romney in Masachusetts. The poll shows Obama leads ­Romney 52 percent to 38 percent, a substantial 14-point margin, but down significantly from last month, when Obama held a 27 point lead over ­Romney in Massachusetts. But even if Romney stays within 14 points of Obama, Brown would still need support from hundreds of thousands of Obama supporters to defeat Warren. According to the poll, the senator is backed by just 12 percent of likely Obama voters, compared with 73 percent for Warren. Women prefer Warren by 7 points, 49 percent to 42 percent, while men prefer Brown by 8 points, 52 percent to 44 percent. They based those ratings in part on the fact Warren led in 11 of 14 public polls taken in September and October, by 2 to 6 percentage points. 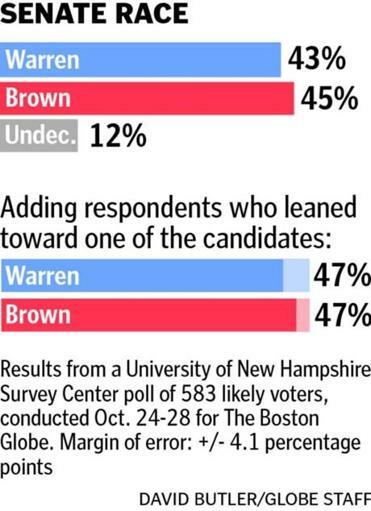 The Globe’s poll showed both Brown and Warren ­remain popular, even after millions of dollars in negative television ads and mailers. Among those surveyed, 54 percent viewed Brown favorably, compared with 37 percent who viewed him unfavorably, a similar result from last month. Among self-identified independents, 73 percent approve of Brown’s job performance. The senator’s lowest ratings came from Democrats and members of minority groups, although 32 percent of Democrats and 45 percent of minorities approve the job he is doing. Warren needs overwhelming support from both to win. Warren’s popularity has suffered more than Brown’s as both candidates have run a ­series of attack ads. She was viewed favorably by 49 percent of respondents, compared with 42 percent who viewed her unfavorably. That was down significantly from last month, when 53 percent offered a ­favorable opinion, and only 36 percent said they viewed her unfavorably. Democrats, minorities, voters who live inside Route 128, and voters in Western Massachusetts gave Warren her highest ratings. Those are voters who form the traditional backbone of the Democratic ­coalition in Massachusetts. Republicans were most likely to hold an unfavorable opinion of Warren. Independents gave Warren low marks, showing how much her path to victory depends on strong support from fellow Democrats. One of Warren’s central argu­ments, that a vote for Brown could put conservative Republicans in control of the Senate, may be effective, according to the poll, which found that three-quarters of voters said control of the Senate was important to their vote.